The story of artist Salvador Dali and one painting that was never cataloged and of which he never spoke. This is the story of artist Salvador Dali and Vision of Hell, a painting that was hidden under a nun’s bed for 30 years yet had a profound effect on the life and work of Dali. Vision of Hell was a painting of one of the religious visions seen by three children in Fatima, Portugal in 1917. Dali was commissioned to work on the painting during a period in his life when he was deeply concerned about his mortality, so much so that he obsessed about death and openly mused about hopes for immortality. He began to study the possibility of being cloned and even considered being frozen in hopes of being resurrected decades later as a means of achieving some form of immortality. As he worked on Vision of Hell, the master found himself being pulled back to his religious roots. He returned to the Catholic Church, keeping it secret from those in his inner circle, and introduced substantially more religious themes into his work, producing four times more religious work after painting Vision of Hell. Yet the master hid his new found devotion from many close to him for fear of losing his intellectual and anti-church reputation. As much as anything, the painting is about the master’s dreams of everlasting life and his attempts to achieve it in any way possible. 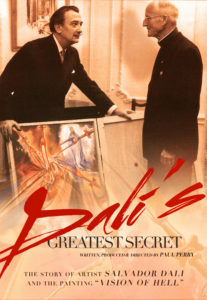 It is an untold story that significantly changed the biography of Salvador Dali. The unsettling painting had been stored at the Blue Army World Apostolate of Fatima in Washington Township in rural Warren County.